Our locksmiths are changing locks in Dartford Bexleyheath Crayford Belvedere Erith Sidcup Kent and near by areas. At affordable locksmiths 24-7 we are experiencing high levels of people moving into new property's within Kent and our near by areas. Please consider affordable locksmiths 24-7 because we have some outstanding deals on lock changes at the moment. Read more about Our locksmiths are changing locks in Dartford Bexleyheath Crayford Belvedere Erith Sidcup Kent and near by areas. Locksmiths gain entry service in Bexleyheath Dartford Erith Belvedere Sidcup Crayford and surrounding Kent areas. Affordable locksmiths 24-7 provide a 24 hour locksmith gain entry service in our south east London and local Kent areas for £50 no VAT in working hours, so if you have had the misfortune of shutting your keys inside your property or just lost your keys or your keys have been stolen, give us a call and take advantage of our speedy reliable locksmith gain entry service. Read more about Locksmiths gain entry service in Bexleyheath Dartford Erith Belvedere Sidcup Crayford and surrounding Kent areas. We have locksmith work in Dartford Sidcup Welling Bexleyheath Crayford Erith Belvedere Kent and our local areas this weekend. Affordable locksmiths 24-7 have lock repairs within our local areas, please do not hesitate to contact us via telephone or email at any hour if you are in need of our locksmith services. Read more about We have locksmith work in Dartford Sidcup Welling Bexleyheath Crayford Erith Belvedere Kent and our local areas this weekend. Door locking problems in Bexleyheath Bexley Erith Belvedere Crayford Dartford Swanley Kent and local areas. If you have a UPVC or Composite door on the entrance to your property and you are having problems locking the door when you lift the handle up and try to lock it, please do not force the lock as you may damage the multipoint locking system inside the door and the door may stay locked causing all sorts of problems for you. This can be a very expensive problem to rectify and an ordeal if your locked outside your property. Read more about Door locking problems in Bexleyheath Bexley Erith Belvedere Crayford Dartford Swanley Kent and local areas. Affordable locksmiths 24-7 Are fitting locks locally on this lovely sunny day, we are still available for locksmith callouts, remember we are not a call centre, we are not VAT registered, there is no callout charge and we have a no fix no fee policy. Affordable locksmiths 24-7 are providing a locksmith service in Bexleyheath Erith Belvedere Sidcup Dartford Kent Thamesmead and local areas this weekend. A busy weekend for most people this weekend the kids are back at school Monday, if you have any lock problems we have a locksmith service in all our local areas for the whole of the weekend, our rates are very reasonable and I am sure you will not be disappointed with the service. Read more about Affordable locksmiths 24-7 are providing a locksmith service in Bexleyheath Erith Belvedere Sidcup Dartford Kent Thamesmead and local areas this weekend. We have locksmiths working on the bank holiday in Swanley Dartford Bexleyheath Belvedere Erith Crayford Kent and surrounding areas. Affordable locksmiths 24-7 are providing complete 24 hour locksmith service for the whole of the bank holiday weekend for all your lock problems and repairs any hour of the day. 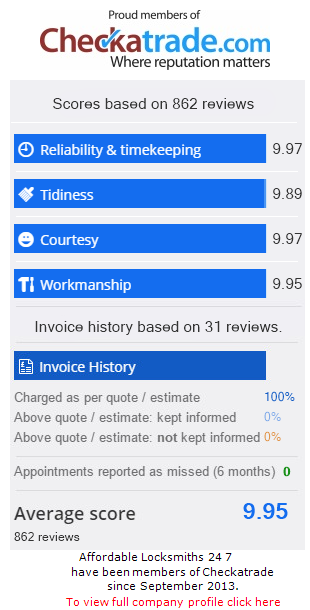 our locksmith rates are very competitive. Read more about We have locksmiths working on the bank holiday in Swanley Dartford Bexleyheath Belvedere Erith Crayford Kent and surrounding areas. Locksmith call outs in Bexleyheath Belvedere Erith Crayford Bexley and Dartford. Affordable locksmiths 24-7 attended a call in one of our local areas this week, the property had a double glazed conservatory to the rear of the house, the key to the back door had been lost and the door was locked and had been for some time. I arrived about 2pm in the afternoon, when I entered the conservatory the heat took my breath away it was so hot and was very uncomfortable conditions to work in. I opened the door and removed the lock and installed a new lock within 15 minutes for a modest locksmith fee. Read more about Locksmith call outs in Bexleyheath Belvedere Erith Crayford Bexley and Dartford. Late night locksith call outs in Bexleyheath Belvedere Erith Thamesmead Swanley Dartford and our local areas. If you are in need of a locksmith in the early hours of the morning in Bexleyheath and our surrounding areas please be persistent with your call we will answer your call and resolve your lock problem. Your business is valuable to us. Read more about Late night locksith call outs in Bexleyheath Belvedere Erith Thamesmead Swanley Dartford and our local areas. Read more about Euro cylinder lock change offer in Erith Belvedere Bexley Thamesmead Dartford Kent and our surrounding areas.